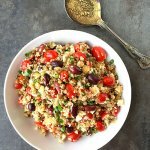 This Sprouted Quinoa Lentil Salad is a deliciously light and refreshing lunch dish that is perfect for the Spring and Summer months. Pack it up and take it on a picnic or to work with you! I don’t know about you, but the warmer weather has me craving lighter dishes lately. 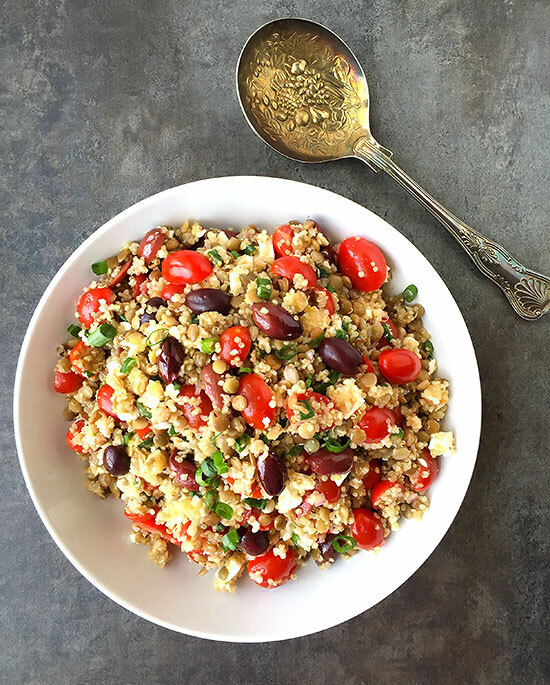 This Sprouted Quinoa Lentil Salad is the perfect lunch for Spring and Summer. It also transports well, so you can take it to work with you. I tend to prefer meals with some type of meat, fish or eggs as my protein, but I think it’s healthy to have some meatless meals occasionally. This might be just a salad, but it’s a very hearty one. I used both store-bought sprouted lentils and quinoa for my salad. If you can’t find sprouted quinoa, regular quinoa works just fine in this. Just be sure to rinse it before hand to get rid of the bitter coating on it. The price on the sprouted lentils usually isn’t too bad at our Natural Grocers, but the quinoa can be pretty pricey. I usually only buy it when I find it on sale. Our Kroger carries the TruRoots brand for both items, and they’ve had a really good sale on both of them within the last few months. If you have a Kroger in your area, it’s located in their organic section. I always check their organic section when I go to see what might be on sale or close-out. It’s a great way to score some deals and perhaps stock up on staple items. You can serve this at room temperature or cover and let chill for an hour or two, then serve. I let mine chill for a couple of hours, then removed it from the fridge and let it sit on the counter for a few minutes before serving. I added a splash of lemon juice before serving leftovers the next day. In a small saucepan, add 1 1/2 cups of water, the quinoa and 1/4 tsp of salt and bring to a boil. 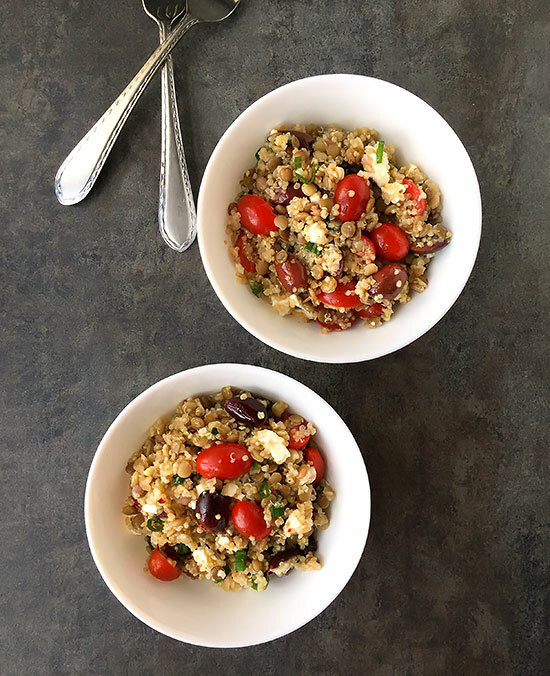 Reduce the heat to low, cover and simmer until the quinoa is tender and has absorbed most of the water,about 12-15 minutes. Let cool to room temperature, then fluff with a fork. Spreading it out on a sheet pan helps to cool the quinoa. Meanwhile, in a medium saucepan, bring 3 cups of water to a boil, add the lentils, reduce heat and gently boil for 5 minutes. Remove from heat, cover and let stand for 4-8 minutes, depending on your desired texture. Drain and let cool. Place the lentils and quinoa into a large bowl. Add the tomatoes, olives and scallions to the bowl and toss together. While the quinoa and lentils are cooking prepare the dressing. In a small bowl, whisk all of the dressing ingredients together. Pour the dressing over the lentil quinoa mixture and toss to combine. Add the feta and gently toss to combine. Serve at room temperature or let chill for an hour or two, then serve. You may want to add a splash of lemon juice before serving.